Eyeglasses - good, bad and the ugly. When your eyesight is bad, corrective eyewear is a big help when doing some important daily activities that require your focus and precision, like driving, reading etc. Most of the people take eyeglasses off only when they go to bed or take a shower. We wear them all the time. Do we need to? Do you know anybody who improved eyesight by wearing eyeglasses or lenses? No. This is, unfortunately, true with most of our health problems, whether it is our eyes, heart or joints. Doctor will give you something (pills, eyeglasses, knee replacement) that will hide the disease, make you comfortable living with it. And it continues to destroy your body. But what about curing, make disease go away - small percentage of doctors can do that. Why you should almost never wear eyeglasses or contact lenses? In order to answer this question we need to know the way how our eyes work when they need to look at different objects. 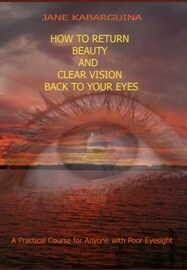 Our eyes act like camera when it focuses, they constantly adjust the focus, lengthening or shortening their components. The iris acts like the diaphragm of a camera, dilating and constricting the pupil to allow less or more light to get in. The extraocular muscles move and rotate the eye in different directions. They also perform coarse focusing by changing the shape of the eyeball to move retina father or closer to the lens depending on the distance to the objects. Ciliary muscle, which is attached to the lens with small fibers, performs fine tuning on the object by changing the shape of the lens. As you can see all of the eye components constantly move. When we wear glasses we give most of the focusing work eye muscles do to the glasses. Also if you wear eyeglasses try this: look at something on the left and then at something on the right. Did your eyeballs move or you were just turning your head? Fixed position of glasses in front of your eyes and ability to see clearly only by looking at the center of eyeglasses’ lens makes you move your whole head instead of moving your eyes. So eye muscles stop working as much as they used to. See analogy – eyeglasses -2, then -4, -6, -20, blindness. Ophthalmologists know that, but why would they care, you will provide steady income for them by regularly changing to glasses with stronger lenses. I also need to mention that eyeglasses change your face structure and therefore your appearance. I need to highlight another point. I do not think that anybody else mentioned that eye sockets become narrower trying to get used to eyeglasses frame. It makes your eyes look smaller and the eye hollows deeper which does not make you look prettier. The cheeck bones move up and you face does not look proportional anymore. There are certain cranial sacral exercises that can help to widen eye sockets and help to move face bones back to place. But this is later.